I can’t say I’ve been all that drawn to Dwayne ‘the rock’ Johnson as a movie star and was never into American Wrestling. 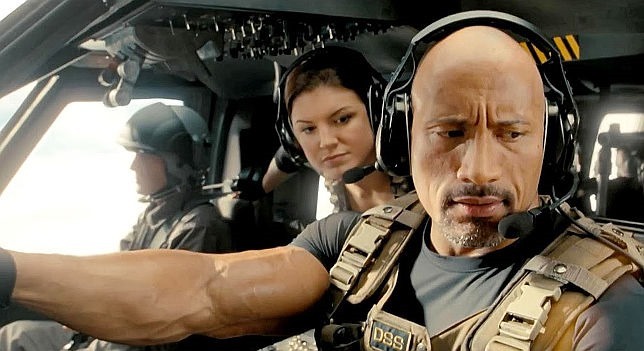 However this disaster action flick seemed like an easy choice for an evening’s entertainment, and hell – isn’t The Rock in everything these days? He plays a Helicopter rescue officer who becomes embroiled in the search for his estranged wife (Carla Gugino) and teenage daughter after a series of devastating earthquakes rumble through California. In the grand tradition of Michael Bay and Roland Emmerich this is primarily an excuse for effects wizards to really go to town as we witness mass destruction, sky scrapers toppling and the hoover dam bursting … all done with some impressive CGI and excellent set design. It’s glossy, loud, intense and very exciting as we watch various individuals try and survive an event that is literally tearing the west coast of the united states apart. It wasn’t hard to get caught up in the story either, with The Rock harbouring regretful memories following the collapse of his marriage, and having to watch his wife move in with another guy (a slimy Ioan Gruffudd). Yet this is also where the story starts to get rather familiar. Yes this is pretty clichéd stuff, the troubled hero trying to piece his family back together and it takes a cataclysmic event for him to realise what he’s missing. Also we get some awful stereotypes such as the typical Hugh Grant-like English lad who is clearly going to be a love interest for the (predictably) hot daughter. 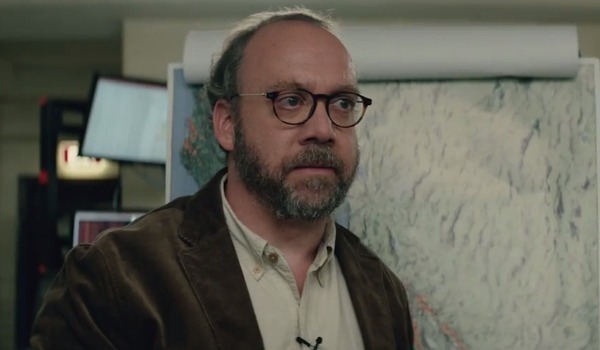 Add to this a scientist (Paul Giamatti) who nobody listens to at first (he may as well be Jeff Goldbum), and some very predictable near-miss almost deaths and – despite plenty of energy and quality effects – I was entertained but not at all surprised. It also get’s pretty crazy towards the end (that cruise ship bit…). Yet although failing to re-write the disaster movie rule book, and sticking a bit too rigidly to formula … for a solid two hours entertainment – I’d still say this is worth a watch. Oh and, The Rock wasn’t bad either. This entry was posted in Drama Reviews, Movies, Reviews, Thriller Reviews and tagged California, Disaster Movie, Dwayne Johnson, Earth Quake, Los Angeles, Paul Giamatti, San Andreas, San Francisco, The Rock by Craig M. Bookmark the permalink. This movie is full of holes but it’s also really entertaining!